Evian is one of the most visible luxury waters in the world. A flagship product of prestigtious Groupe Danone, Evian's source in Haute Savoie was discovered in 1789 by the Marquis de Lessert. Nitrates are acceptable at 3.8 milligrams per liter; other than that, there really is nothing exceptional in Evian's chemistry besides the strong level of Silica, and low Sodium content. 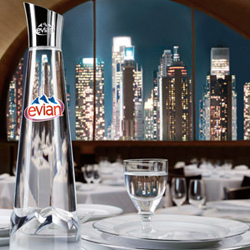 With its neutral 7.2 pH, Evian is a smooth and hydrating drink, providing a signature taste enjoyed by many.